DayWatch is the sequel to Nightwatch. It is a gripping story about how the world ends, as the battle between light and dark comes to a turning point. Beautiful and compelling storyline, I really enjoyed it, especially the Russian version. 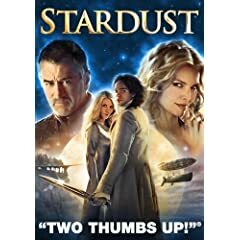 ALso saw StarDust, which was sweet, but too bland. The ideas about true love are okay, but the plot twists are a bit too sophomoric. The character development was a little shallow, although the evilness of the villainous witchsisters was good. It was a good plane movie, but I didn't find the story that satisfying. I enjoyed the theme of finding and recognizing true love, although it wasn't really weirdly humorous enough to become a cult classic, like The Princess Bride.